New Hampshire primary day; Omnicom Q4 and full-year 2015 earnings; Twitter launches anti-harassment task force; Is Chipotle blaming employees for its E. coli outbreak? ; Instagram lets users switch accounts more easily. 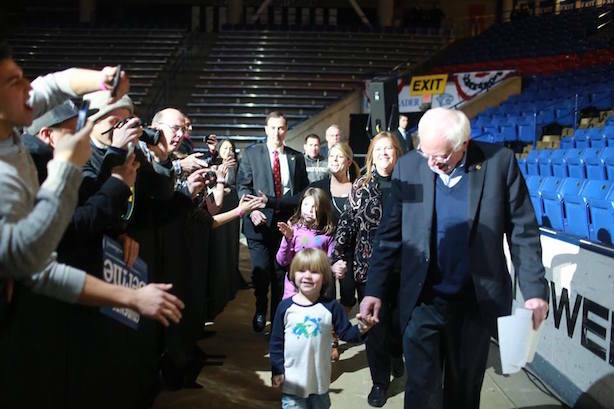 Bernie Sanders campaigns in New Hampshire. (Image via Sanders' Facebook page). Omnicom Group’s PR firms saw a 6.9% organic revenue drop in the fourth quarter; organic revenue was down 1.4% for its PR firms for the full year. Omnicom owns and operates FleishmanHillard, Ketchum, Porter Novelli, and Marina Maher Communications, among others. The holding company’s worldwide revenue was up 4.8% in Q4 and 5.3% for the full year. Its net income was up 0.6% in the fourth quarter and down 0.9% for 2015. As a whole, the earnings beat analysts' expectations. Donald Trump and Bernie Sanders are holding big leads in New Hampshire as state residents go to the polls in the country’s first primary election. Undecided voters are expected to play a huge role in determining the winners, as will the snowstorm hitting the East Coast. Sanders and John Kasich came out on top in towns with midnight voting; Marco Rubio had another "Rubiobot" moment on the campaign trail on Monday night. Trump, meanwhile, used a crude term to describe Ted Cruz. Feeling a sense of deja vu from 2008, Hillary Clinton could shake up her campaign staff if Sanders runs away with New Hampshire. Messaging and digital operations could be affected by the reorganization, according to Politico. Former New York City Mayor Michael Bloomberg also told the Financial Times on Monday that he’s considering throwing his hat in the ring. The platform said in a blog post early Tuesday that it is forming a Trust & Safety Council to cut down on abuse, harassment, and bullying. "With hundreds of millions of tweets sent per day, the volume of content on Twitter is massive, which makes it extraordinarily complex to strike the right balance between fighting abuse and speaking truth to power," Twitter head of global policy outreach Patricia Cartes said in a blog post. The fast-food chain is planning to give employees paid sick leave, one item on the agenda at Monday’s temporary shutdown and all-hands meeting. However, that played in the media as Chipotle blaming its employees for the E. coli outbreak that ravaged its fourth-quarter sales. Customers at a Chipotle location near PRWeek’s offices in Manhattan were surprised by the shutdown on Monday. Super Bowl 50 was less talked about on Facebook and Twitter than last year’s NFL championship game. Fewer tweets were also sent this year, though numbers for that platform are less clear. The game drew the third-largest TV audience ever. The Facebook-owned platform is allowing users to switch among multiple accounts. Users can go back and forth between as many as five accounts without logging out. Instagram announced the changes on Monday in a blog post.